(a) Secure the steering column assembly in a vise. When using a vise, do not overtighten it. (b) Install a service nut to the steering main shaft. (c) Install the steering wheel assembly set nut to the steering main shaft. (d) Lock the steering wheel assembly set nut using the service nut. (e) Using a torque wrench, turn the main shaft and measure the preload. 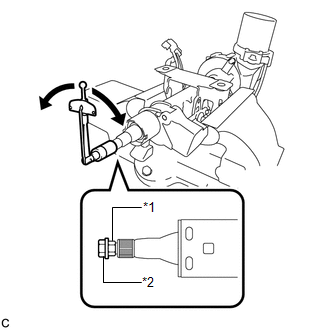 If the preload is not as specified, replace the steering column assembly. 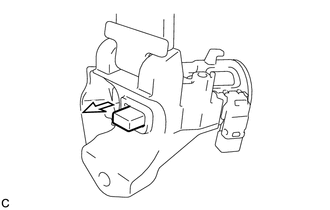 (a) Check that the steering lock mechanism is activated when the key is removed. 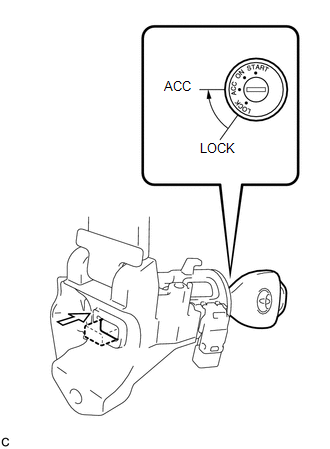 (b) Check that the steering lock mechanism is deactivated when the key is inserted and turned to the ACC position. If there is any abnormality, replace the ignition switch lock cylinder assembly or steering column upper bracket assembly.